PunkNews.org, Paper+Plastic and Limited Pressings recently began a sweet auction for Haiti relief that I was going to post about, but then the Grammys happened, and I forgot about it. The auction is ongoing and has so far raised around $16,500 for Haiti relief. All proceeds go to my favorite organization, Doctors Without Borders. Green Day vinyls are being auctioned, so if you are lucky to have a record player (I’m not so lucky), go and take a look at all of the punk artists on auction now. The Grammys MusiCares Foundation is auctioning off some Green Day-related items as well, though these aren’t for Haiti relief and some of them have a high starting bid threshold. Check them out, though. 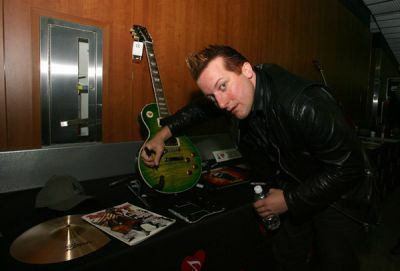 There is a signed Les Paul guitar, signed photographs of the band, and a signed vinyl copy of 21st Century Breakdown. While the auction isn’t for Haiti relief, it is for a good cause nonetheless. You can find out more about MusiCares here.